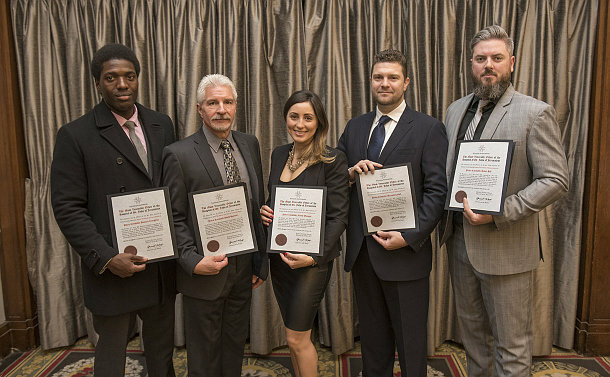 Toronto Police officers were honoured for saving lives both on and off duty by St. John Ambulance. Constable David Hill and other officers were faced with frigid waters when a man tried to end his life in Ashbridge’s Bay last October. With the victim venturing out into the frigid water, they had to decide if they should wait for the Marine Unit or jump into the water. They chose to put their own lives on the line right away. Hill said they informed the Marine Unit of their exact location before he and few officers went into the water. Constable Nicole Mangos, who has been on the job for just over a year, was also one of the officers who braved the cold water. Superintendent Neil Corrigan attended the event to show gratitude to two of his 14 Division officers who went above and beyond the line of duty. While on her first day of vacation in Mexico last year, Constable Olga Daydova jumped into action after a woman fell from a balcony. “I was taking photos outside when I heard a thud and when I turned around, I saw a female without clothes on the ground,” she recalled. Daydova performed CPR and stabilized the victim until paramedics arrived. Constable Marie-Josee Fournier was in her scout car heading back to 14 Division when a call came over the radio that a man was having a heart attack. Fournier performed CPR and revived the victim until paramedics arrived.